RAHWALI: Matloob Haider, an aspiring bodybuilder, didn’t betray any sign of strain when he returned home late last Tuesday night. As he was prepping for the Gujranwala bodybuilding championship, he had started to spend more time at the gym. After all, it was the first contest the 22-year-old had ever planned to take part in; he wanted to win. “He ate his dinner and sat here chatting with me. All of a sudden, he started complaining of suffocation in his chest and asked me to take him to a doctor,” says his ageing mother at their home in Rahwali, a small town a few minutes’ drive from Gujranwala. She rushed him to a nearby clinic and was advised to immediately shift the youngest of her five sons to a bigger hospital in Gujranwala. “We were calling Rescue 1122 to arrange an ambulance when Matloob collapsed and stopped breathing,” she continues, her eyes wet. Matloob had started training at a nearby gym at the age of 13 and was soon employed as a trainer there. Though he had never participated in a bodybuilding championship, the boys he helped train have won medals in several competitions. Matloob was the fourth bodybuilder to die within the short span of two and a half weeks between April 2 and 19. Like him, two others — Hamid Ali aka Ustad Gujju from Sialkot and Rizwan Ahmed from Gujranwala — were reported to have suffered sudden heart attacks. The fourth, Hamayoun Khurram, who was from Lahore and a gold medallist in the recent South Asian Bodybuilding Championship, is claimed by his family to have died after his trachea tore whilst eating. No investigation has been carried out, but media reports blame widespread and unsupervised use of performance-enhancing drugs, growth hormones and steroids. In Sialkot, Rizwan Ali, younger brother of Ustad Gujju who won the bronze medal in the Pakistan Bodybuilding Championship only two days before his death on April 2, insists that his brother didn’t use any kind of food supplements or drugs. “My brother died of a heart attack. I don’t know why the TV channels are insisting that he used to take steroids,” he says, conceding though that the 41-year-old bodybuilder had some time ago developed liver and stomach problems, a common outcome of the frequent use of muscle-building substances. 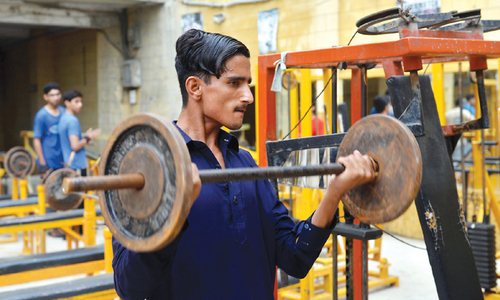 Shahzad Akhtar, an information technology student at the University of Sargodha who used to work out with Matloob, is not sure whether his trainer took food supplements, but contends that most struggling bodybuilders frequently take such substances. Some gym operators concede that the “abuse” of food supplements by bodybuilders is on the increase. “There are reasons for this rapid increase in the use of such substances. Bodybuilding is not just a sport; it is a lifestyle that not everyone can afford,” explains a gym manager in Johar Town, Lahore, on the condition of anonymity. The president of one of the two factions of the Pakistan Bodybuilding Federation (PBF), Shaikh Farooq Iqbal, is reluctant to acknowledge a direct link between dope and the deaths of the athletes. “We don’t have any evidence to suggest the link except speculation. But we are taking action with the help of the government to check the abuse of food supplements and endurance drugs,” he argues. The PBF has cancelled the registration of all fitness clubs and gyms and asked them to provide affidavits that they do not encourage the use of dope. “Those failing to do so may face closure,” he adds. Mass poisoning deaths after taking sweets in Layyah can be compared with this incidence. It is possible, the Gym providing performance enhacing drugs to its members against payments. All this need to be checked and controlled. People. You need to know the difference between growth hormones, steroids and food supplements. The first two are dangerous but food supplements are fine to use and help provide necessary nutrition. Protein supplements etc. don't mess with your organs like steroids and hormones do. In the absence of evidence, the cause (steroids) and effect (heart attach) relationship is merely speculative. There are any number of professional athletes who have been taking PEDs but there are no widespread concerns of heart attack. One has to examine the total population of body builders, and then find those who have been taking PEDs, and then trace the issues faced by those who took PEDs and those who didn't take PEDs, while controlling for other factors. The story does NOT do any such analysis. Given the lack of evidence, "desi ghee" is as likely a culprit as "steriods." If our food and drugs authorities start paying attention to this growing problem, many aspiring athletes could be saved. Our state should focus on issues that affect common pakistanis rather then spend millions on fighter jets, militants, and our influence in afghanistan and kashmir. Don't they know such drugs are banned at the Olympics and there are mandatory drug tests??? There is absolutely nothing wrong in taking food supplements as a part of a healthy and balanced nutrition strength training/ bodybuilding program. Infact, quite the opposite. The protein supplements are quite low in fat and carbohydrates and make it easy for athletes to make up their requirement rather than simple dietary sources of protein which are quite rich in fats and carbs. Anabolic steroids/ hormones are altogether different and should not be used. @surendra sukhtankar The Olympics have the best drug tests in the world but they're still a joke. One can simply avoid detection by cycling drug use intelligently and going off them some time prior to the event so that they don't show up when tested. 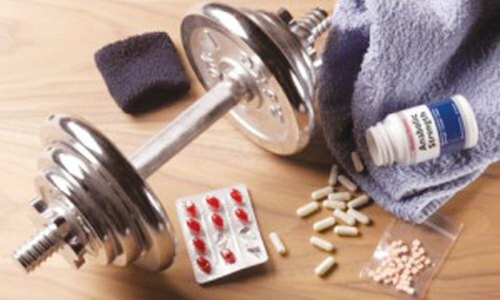 Non steroid supplements like DMAA, ephedrine, and even creatine in some instances also have been linked to deaths. There have been many pro wrestlers and some big name bodybuilders who died early of possible steroid abuse. The craze of being best at the body building is the main cause.